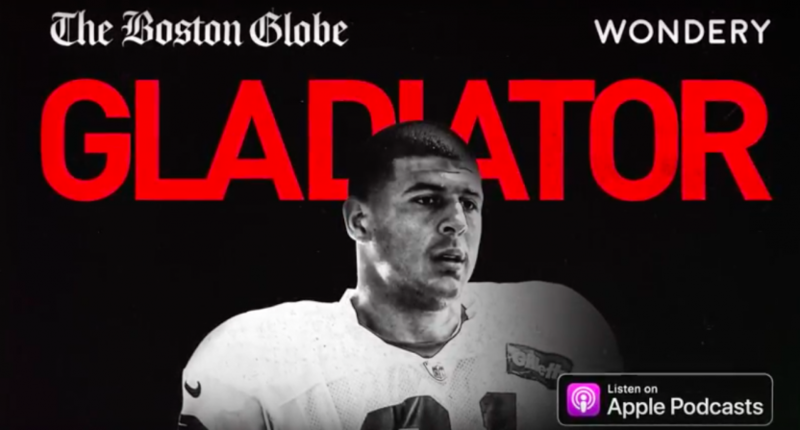 Podcast: Gladiator: Aaron Hernandez & Football, Inc.
What’s It About? : Just in case you somehow missed all of this, let’s do a brief recap. Aaron Hernandez grew up in Bristol, Connecticut, became an All-American tight end at the University of Florida, was drafted by the mighty New England Patriots where he became one half of the league’s most dominant tight end duo with Rob Gronkowski, and played in Super Bowl XLVI, which the Pats lost to the New York Giants. Off the field, Hernandez’s life was riddled with legal issues and criminal activity. After three seasons in the NFL, he was arrested and charged for the murder of Odin Lloyd, for which he was found guilty and sentenced to life in prison. He was also indicted for a double murder that had occurred the year prior but he was acquitted in 2017. A few days following that acquittal, he was found dead in his cell of an apparent suicide. Gladiator: Aaron Hernandez & Football, Inc. wants to tell the story of football in America through the lens of Aaron Hernandez’s life. While the podcast delves into his background, his childhood, and what happened in his life, it also asks questions about the sport he spent so much of his life playing and what factor it played in the equation. Was CTE damage to Hernandez’s brain a contributing factor to how his life turned out? Did the hyper-masculine nature of the sport force him to mask his true sexuality, which negatively impacted the way he lived his life? Did some of the top football coaches, administrators, and executives ignore or hide Hernandez’s problems because they only valued him for his talents on the field? Who’s The Host? : Bob Hohler, a sports investigative and enterprise reporter for the Boston Globe. While Wondery is the podcast company behind the show, they’re working with the Boston Globe. Hohler put the show together as part of the Globe’s Spotlight team, which you probably know for their investigation of the sexual abuse scandal inside the Catholic Church that was turned into an Academy Award-winning film. If anyone is going to go in-depth on the Aaron Hernadez story to find out what really happened, it’s going to be them. In fact, you can also read their reporting used for the podcast on their website (with subscription). What’s a Normal Episode Like? : As of the time of this review, only the first two episodes have been released. While you might assume they’re going to take a chronological look at his life, they instead seem to be weaving between eras in order to make thematic conclusions surrounding Hernandez. The first episode details the world that Hernandez was born into, a father known by the nickname, “The King,” and how the home Aaron and his brother grew up in shapes them both for the rest of their lives. The second episode, they detail how his personal life spiraled out of control before and during his brief NFL career. It also delves into how teammates seemed unable to truly know or understand him, and what might have really been happening below the surface. Episodes so far have been in the 38-minute range, which is enough time to tell a story without overstaying their welcome and overburdening listeners with too much information. They’ve also done a good job balancing the many threads that could easily take over the entire podcast, including Hernandez’s apparent sexuality and the violence instilled in him by his parents at an early age. Presumably, future episodes will delve into the fact that Hernandez’s brain show signs of serious CTE effects and how that may have affected him, as well as the ways in which legendary football coaches like Urban Meyer and Bill Belichick perhaps could have helped Hernandez instead of excusing his off-field behaviors. Who Is It For? : In theory, Gladiator works for anyone interested in what happened to Aaron Hernadez and the circumstances around his murder conviction. However, after listening to two episodes, it does feel like they simply don’t have enough time to cover all of the ground involved, including minute details surrounding the murder of Odin Lloyd or the specifics of Hernandez’s time with the Patriots. In that sense, it might be good for those who have absolutely no background in the story to do some research of their own before listening, even if that means perusing some Wikipedia pages about him and what happened. A little bit of background could go a long way to enjoy the podcast, rather than spending the whole time wondering about the minutia in-between. Who Is It Not For? : If you’re someone who does not enjoy listening to stories that involve child abuse, accounts of murder, and criminal activities, you might be turned off by some of the details in this show. If you found yourself tuning out the Aaron Hernandez trial or it’s saga while it was happening, you also might not be interested in the podcast, though it’s possible the angles the show take will give you some fresh perspective. Where Should I Start: You kinda have to start at the beginning on this one. The first episode, Bristol, sets the tone for the entire podcast, introduces all of the relevant people, and explains the many themes and ideas they’ll be exploring in the episodes to come. So, Should I Listen To This? : So far, so good on this investigative podcast. Look, anything the Boston Globe Spotlight team does is probably going to be worth your time. And while Gladiator isn’t as salacious as some of Wondery’s likeminded podcasts (Dr. Death, Dirty John), it delves into some extremely important issues that everyone involved with the sport of football, including fans, needs to assess, and does so through the story of a very troubled individual who seemed to experience everything good, bad, and ugly about it.